Picture a dairy farm in Scotland. It is a summer evening. The sun sets on a pasture, casting a warm glow on several large, canvas tents made in the 1940s. The cows can be heard loaming on the other side of a soft green hill as they march toward the barn for their evening milking. Grasshoppers flit through the green field as swallows dart wildly to collect their last meal of the day. A large hardwood fire has a whole lamb roasting over it. Inside the main tent sits a long table awaiting a score or more of guests who have paid £20-30 each to share in a large meal together. In the nearby kitchen tent you will find a crew of volunteers, toiling to prepare dinner using janky gas stoves and a wonky refrigerator. Welcome to Enroot, a collaboration, business and artistic practice founded by DeVonn Francis A'15 and Angus Buchanan-Smith, a senior whose final presentation opens on November 17. "Across the UK hundreds of dairies have been closing every single month," Angus says, "so we set out to try and preserve the knowledge that's embodied at any one farm. We would travel around, arrive at a farm, spend about a week there and rally around working towards these dinners that we would host at the end of the week. The idea was to get the community together to understand the importance of supporting your local agriculture." DeVonn picks up the thought, as the two of them often do for each other: "But the structure was a bit more interesting, I think, than what you see happening here in New York, where you have people who are doing lots of pop-up dining experiences charging X amount for a tasting menu. It was a way to not only say, 'Hey we are doing these dinners,' but also how can we share the stories of these people who don't have the time to network and be social to connect with a larger market or larger audience." DeVonn, the son of Jamaican immigrants, grew up in Virginia and has spent much of his time in professional kitchens, starting when his father opened a West Indian restaurant. He attended an arts magnet high school, and ended up at the School of Art through fairly conventional means. That cannot be said of Angus, who grew up on a dairy farm outside of Edinburgh, Scotland. Though he liked art and even assisted on a local project by Andy Goldsworthy, he was planning on attending university in the UK to study "geography and business." But he spent his year off after high school in New York, where a local cousin pushed him to look at The Cooper Union. "The fact that I enjoyed the home test so much was really a no-brainer. When I got offered a place I said, 'Of course.' " Among the various things he accomplished during his time here, he became the first recipient of the James Craig and Irene Scala Designing with Type Award. Proving once again that the skills honed in the School of Art can be parlayed in many directions, they established Enroot with a Kickstarter campaign back in the spring. 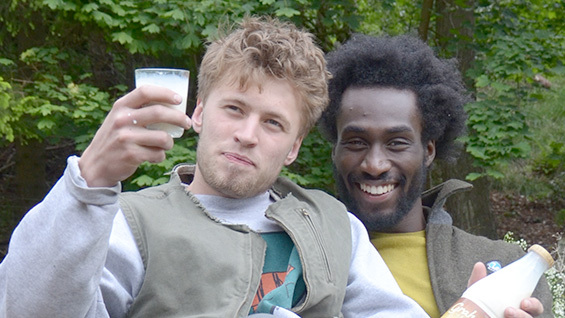 Their goal would be to bring greater awareness to the shrinking Scottish dairy industry by camping out at several farms over the summer, inviting locals to visit and culminating their weeklong stay with an al fresco dinner they would cook using locally sourced ingredients. Over the summer the two of them hauled a livestock trailer filled with tents and kitchen equipment around the UK, visiting four farms in all. At each stop they would get volunteers to assist in the videography and information gathering, with everyone sleeping in tents at night. A website took reservations and payments for the dinner. After trying different price-points to cover the costs they incurred, they settled on a pay-what-you-wish system that was "really successful," though they still haven't made enough to pay themselves. But what did they serve? "We didn't want to overcomplicate ourselves," Angus says. "If you are outside, against the elements, making a poached egg is pretty crazy because it is going to get cold pretty fast. It just doesn't work. We couldn't keep our plates warm. If we did cold plates we could plate it up in advance, but doing warm things we would try and run that stuff in a big bowl as fast as you can. That's why we did things family style." The menu remained simple, DeVonn says. 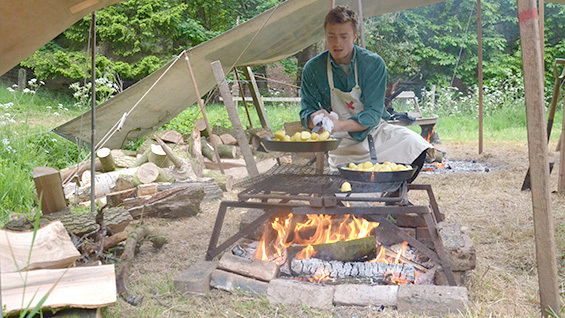 "As a chef I am curious about old traditions of cooking and preserving food. So we did a lot of cured trout. A lot of pickling." It's an unusual-seeming form of artistic practice, but one with deep roots in their experience at The Cooper Union and their education at the School of Art. "Our ability to collaborate with people is key, and it comes out of our experience with the occupations and the student activists here," says Angus, who ran the "front of the house." "Also our ability to sit back and think about every move we make in a concise way, rather than just doing it. Learning to critique yourself in that way is an amazing skill that you don't learn elsewhere." DeVonn adds: "We can both now see that having a dinner is a very curatorial venture. The way that you think about a menu and the way you think about what sort of people are coming and what you are going to talk about is all about curation." On November 17 Angus will open his senior presentation, entitled "Level with the Creamline," based on his experiences with Enroot. He will be installing a long table with hand-built benches and serving a meal, as well as using the space for collective "exercises" to facilitate conversations. Videos from the Enroot trek will be showing. 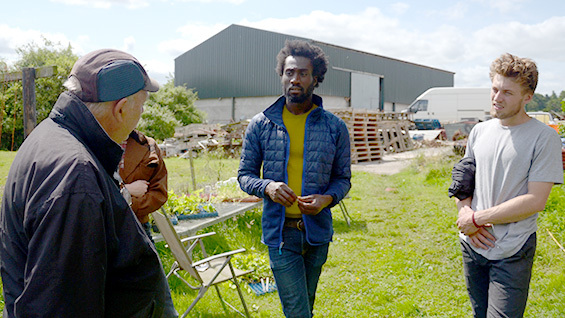 After that Enroot will continue its work developing more videos and a book and returning to Scotland for more of their table-to-farm style of collaborative dining. "There is definitely a performative aspect to our work," Angus says. "We break it down for people to see actually how the meal is prepared. They walk in and go, 'What is that?' And you can tell them. Then they see it on the plate in front of them from this farmer this is sitting next to you. Being able to introduce the farmers to the guests was a really poignant moment. People think twice about they are eating, and I think their appreciation for what they are eating goes up immensely."